Do I need an Exit Plan or a Succession Plan or Do I Need to Make My Business Saleable? Where Do I Start? You need all three. But you need to do each of these things in a certain order. Plus you have to add one more step and this one is a whopper. The important part for you though, is to recognize that each of these actions are different, not one and the same. They are set of sequential events. Make my business saleable. Finds and fixes the issues that make the business un-saleable and un-transferable and maps your course to make these changes personally and inside the business. Design a Succession plan. Puts your personal estate in order and organizes who will take over from you. Work with an Exit planner. Starts the process of putting the now saleable company on a path to get a deal done so you breakthrough all the barriers to a successful exit. Here is the whopper step. It’s actually the first step. There is no point in investing in any of these other actions until you come to terms with this first one. Seriously. I’ll explain shortly. What does this mean? It means you have to decide at least 2-4 years before you want to exit which outcome you want: to continue your Lifestyle business that is un-saleable and will eventually close. Or to switch gears and become a Wealth Generating business that becomes transferable and saleable to family members or employees or to external buyers. Thinking you don’t need to take this step or make this decision? Let’s see why you might be suffering under the weight of this confusion. I think brokers and investment bankers are shooting themselves in the foot with this marketing strategy. They are just earning a lousy reputation. Secondly, why would they want to represent a company that is most likely un-saleable? Their marketing strategy is a serious waste of everyone’s time and energy. Never mind the massive disappointment that comes when an owner doesn’t get any offers or only gets bottom feeders because the company is not positioned to be able to sell and buyers know it… and owners don’t. And then the owner has to find the will and energy to go back into his or her business and keep running it without an exit in sight. But worse, these marketing calls spread false hope to owners like you and perpetuate the myth that you can sell when you want, for what you want. Why is this a myth? Your company is successful for you. Not positioned to be successful for the next owner. Buyers are acquiring the ability of the people left in the business (not you) to produce growth. If they can’t see how they will get that growth, they are not interested in buying. 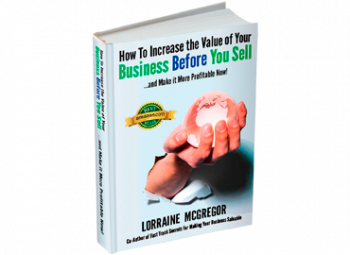 The statistics show that 90% of owners that try to sell without having taken all 4 steps, fail to find a buyer. Do You Really Want a Return on Your Investment in Your Business? 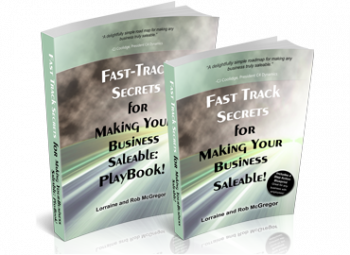 So how do you make this critical decision to turn your company from Lifestyle Business into Wealth Generating Business and then make it saleable? You have to want that outcome for yourself, for your family, for your employees, for your customers and your local economy. Imagine if you have to close your company down in the not so distant future. You will witness it’s slow decline. That’s not an outcome that many owners can stomach. So your first step is an emotional one. You’ve built your business up to where it is today. Now you have to start letting go emotionally, psychologically, and operationally. Yes, this work must start now, 2-4 years before you want to sell. If you don’t let go now, then all the investment in succession planning and exit planning won’t pay off. Even when a buyer comes to call. Even when a broker brings you a buyer. You won’t be able to sign the deal. You are still too attached to what you have grown from scratch. The offer won’t be what you had hoped because you didn’t make the company worth what you wanted to sell it for. So you’re disappointed right from the beginning in the deal. You are now also up against the spectre of either working for the new owner or leaving your business with nothing to go to that makes your heart sing. Want a Better Future for Your Business? 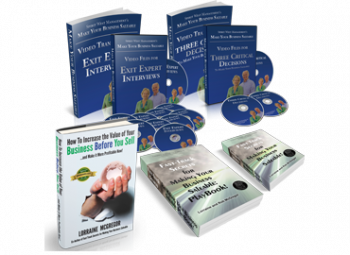 If you don’t want the future you are currently heading to, a Lifestyle Business that is successful for you, but not the next owner, learn how to get on the Wealth Generating path by reading How to Increase the Value of Your Business BEFORE You Sell.